People are searching for the NUMS Entry test Registration procedure and all the other information, but are unable to find out various related details on the internet. If you are the same person than you have arrived at the right spot and will get all the details in a plate for breakfast or lunch or dinner. Kindly stick to the post till the finishing line to visualize more and more. Our team will provide the step by step details about the procedure on how to access and fulfill the NUMS entry test and will tell you about the admission details of this Institute. This establishment is a huge win for the education system of Pakistan as though it provides the best serving in terms of Doctoral degrees and has Army Institutions under its domain as well. We are talking about a huge game over here which is fundamentally approaching towards glory day by day. At this time of the year, everyone starts talking about getting admission in a good learning firm for a brighter future. Mostly want to go into doctoral degrees and under NUMS Entry Test Domain. They want to make the most out of their lives and put efforts for flourishing and shining. Entry Test is one of those words which Shakes a student’s inner self when he or she hear such word coming from any direction. Now let’s move towards the original discussion here, first we will put forth some of the common questions which are asked here on the internet or the social media about NUM’S Entry test exam. Firstly basic Questions include the Qualification requirement and the eligibility criteria for applying for appearance in this Entrance Exam. The person should be having at least or minimum 60% passing marks in his or her Matriculation, Intermediate (Pre-Med) or Equivalent Education. For those candidates who are awaiting for their results in intermediate annual examination are given a relief to apply on the basis of their part – 1 result card or mark sheet. For those who candidates who have to study the background of O-A Level, those applicants who are currently appearing or sitting in their annual Examination can apply on the basis of the result card of their O Level Education. Catch here is that, the applicant must have to provide a clearance certificate from Inter Board Committee of Chairmen known as IBCC. It is to be noted that the confirmation of the admission will only be given on the basis of A-level results. Students who are coming from abroad are also eligible to apply on the basis os SAT-II Exams. They should or must have a minimum of 550 marks in every three subs of science. It is eligible for all Pakistani, Gilgit Baltistan and Azad Kashmir. It is a very easy task if done correctly and with proper understanding. First off, the person has to go on the official Website of NTS, after loading up, click on the Button Labeled as “New Projects”. When the person will look into the opened page, he or she will have to go through and find the Button which says “Click Here” and push that button. This will take the user to another Page. The user will see a table which is put in front of the candidate, for online registration “Click Here”, Again the user has to click on the button. A form will pop up in front of you and you will have to fill out the form with accurate credentials. After this, the application form will be posted towards the NTS Office. Application Form, which is to be sent to the NTS Office must have to be received within the given period of the last date of submission, in any delay case, the administration is not responsible. If the courier company delivers the package late, still no response is to be forged upon this establishment. An applicant who is applying for the test must create a password which should have a length of at least 6 characters. A secret question will be asked in the signup form and the person will have to fill in the answer for safekeeping his or her password. Now, your account sign up procedure is complete, you just have to wait and be patient. In Case of a new program submission, the applicant will have to sign up again and do the math again. Also, apply on LCC Lady cadet course after graduation in MBBS and BDS. Fill in the information about yourself which is asked. Carefully re-read the information which is submitted and then click on any further button. Next phase includes uploading of the photograph. If the person does not upload his or her recent Photograph, due to this, a procession of application will not be put forth or in action. After such steps, click on the submit button and wait for it to properly submit. The user is directed to keep a photocopy of the form (Application Form) for Safety purposes. He also needs to attach 2 recent photographs on the Printed form. The application must be sent with original Deposit Slip, Any other or photocopied slip will not be taken for granted. We will discuss the Army Medical College Admission Process, this will start after the Declaration of the Entry Exam Results. 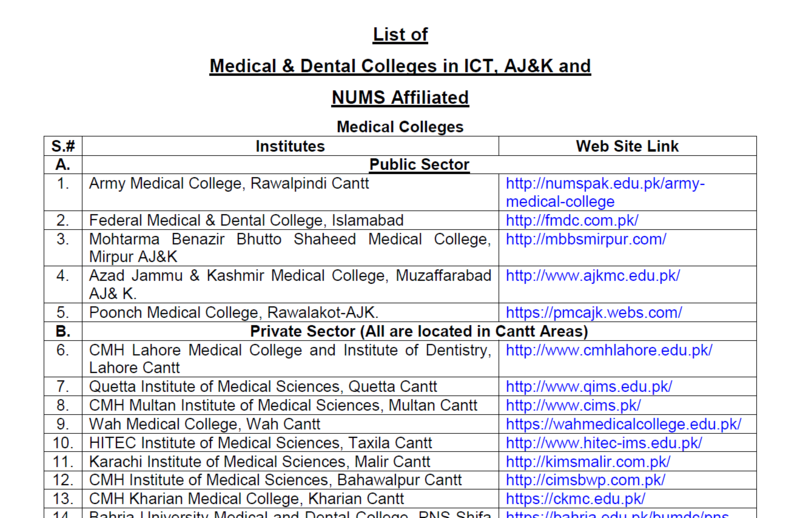 To get admission in AMC, the candidate has to apply to the National University of Medical Sciences. Prospectus and the samples of the application forms will be available on the official website online along with all the necessary details about the relevance of the topic. Selection of the candidates will be done according to their results of matriculation, Intermediate and most of the total marks of NUMS test. 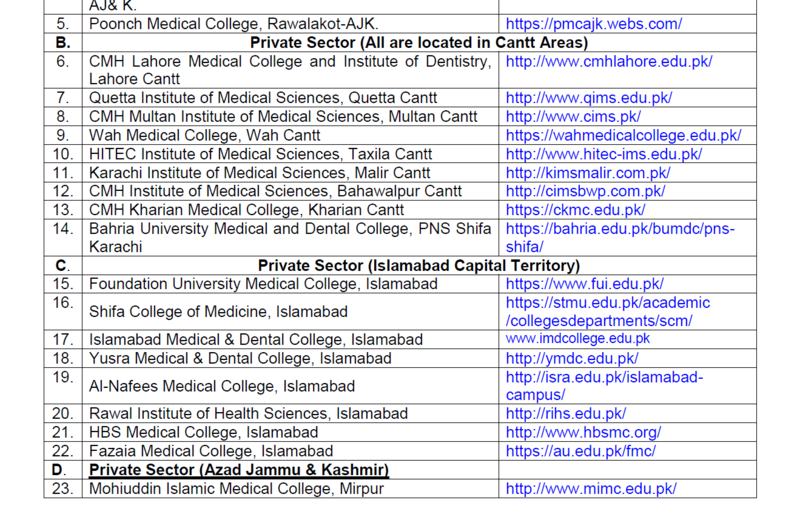 Admissions are totally based upon NUMS Merit List and is eligible for all over Pakistan which also includes Azad Kashmir and Gilgit. 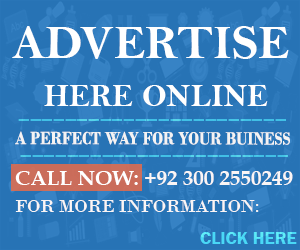 There are various Steps which are to be taken in precautionary measures, First of all, you have to apply for online request to get hands on the Prospectus, this Process can be done by Clicking Here. After the submission of the request, the applicant will be able to get the prospectus within 24 hours, getting the prospectus will lead to exploring, the candidate must look for the term ARN known as Application Registration Number which should be mentioned on the very first page of the prospectus. Now all the remaining work is the filling the form Online for NUM’S. There’s No such thing as Online Test service in National University of Medical Sciences , the applicant will have to go to the proper location and sit in the examination hall to attempt the Entry test Protocol. There are many online education providers who are willing to provide quality education for this purpose and will serve a good hand in opening an opportunity for the student. Online Preparation books are also available on various sites, some of which are free while some cost money. Now it is very easy to calculate your very own Aggregate by using NUMS Merit and Aggregate Calculator. This particular calculator predicts you’re Admission Chances which are totally based on your Aggregated Marks. Past Papers for NUMS Entry Test are also available on the internet to study from them and get the useful details of polishing skills of your own. This is very helpful for those candidates who do not know anything about the examination. Kindly check online >for grabbing the papers of your own interest and study them with proper Wisdom and wit. I couldnot find the application form for entry test 2018 of NUMS.Will someone help me? How I can apply and what is the date of test…,? Kindly help me..
sir nums admission kb start hongy….. Currently, no admission’s announced by NUMS Medical University. At the time of admission, the Registration form will be uploaded. What is the expected date for nuns entry test and when will be its registration opened and what is its procedure? how i can find registration form for nums test…..plz help me….? kindly,tell me the last date for nums test amd fm&dc test’s registration?